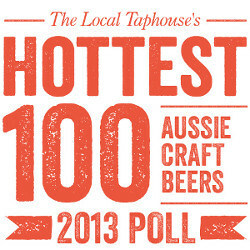 Major kudos to Guy, Steve and the team at the Local Taphouse for organising the Hottest 100 Aussie Craft Beer poll. It is a great event that promotes craft beer across Australia. Well done and thank you. Nothing else to see here, go about your business as normal. This entry was posted in Uncategorized on January 29, 2014 by William Wilson.